This post is sponsored by Mazola®. Salted Dark Chocolate Popcorn is the perfect sweet and salty treat to share with the ones you love, using better for you ingredients! I love popcorn. It is such a great snack for the kids after school, movie night, or whenever the craving strikes me. Years ago I made the microwave kind. Super convenient in the portioned bags, but oh, the salt. The sodium levels are through the roof! Then our microwave went on the fritz, so microwave popcorn was not an option anymore. We actually never did replace the microwave! We seem to do just fine without it and we have more counter space to boot. I started using an old air popper that I must have inherited from someone, because it was ancient. It did us well for a long time, but eventually it kicked the bucket, too. I was going to invest in a new air popper, so I put out a call out on The Two Bite Club's Facebook page to see if anyone had a recommendation. Several people suggested popping it in a little bit of oil on the stove top. Why had I not thought of that? I tried it and it was PERFECT. So fast, so easy and the perfect light snack. 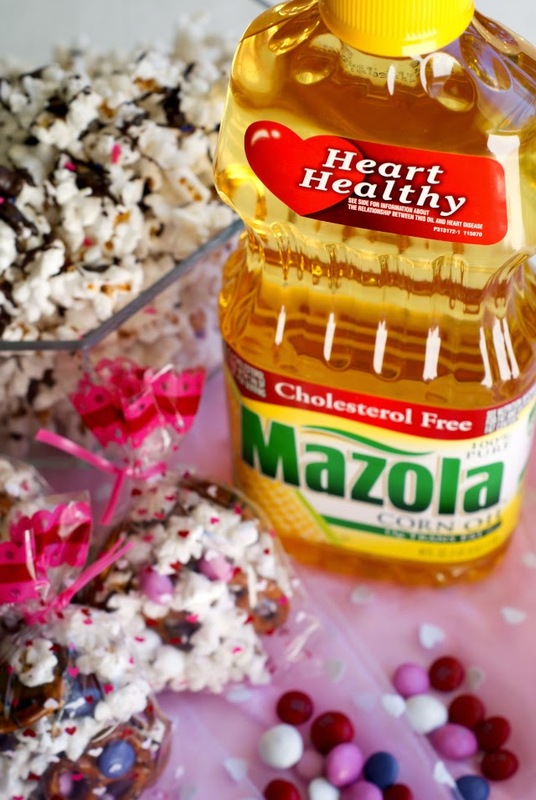 I use Mazola Corn® Oil to do my popping because a recent research study showed that corn oil can help lower cholesterol more than extra virgin olive oil. It's a great study and you can read all about it at Mazola.com. Corn oil also has a high smoke point, making it great for popping corn as well as everything from sautéing and grilling, to stir frying and even baking. It has a neutral flavor, so it brings out the flavors of the other ingredients. In this case, the corn! I drizzled my popcorn with dark chocolate, which has lots of health benefits when eaten in moderation. This recipe used just a half a cup of dark chocolate for the roughly 16 cups of popcorn that this recipe yields. Just enough sweetness without going overboard. Then, all you need is a little sprinkling of coarse salt to balance out the sweet. Perfection! 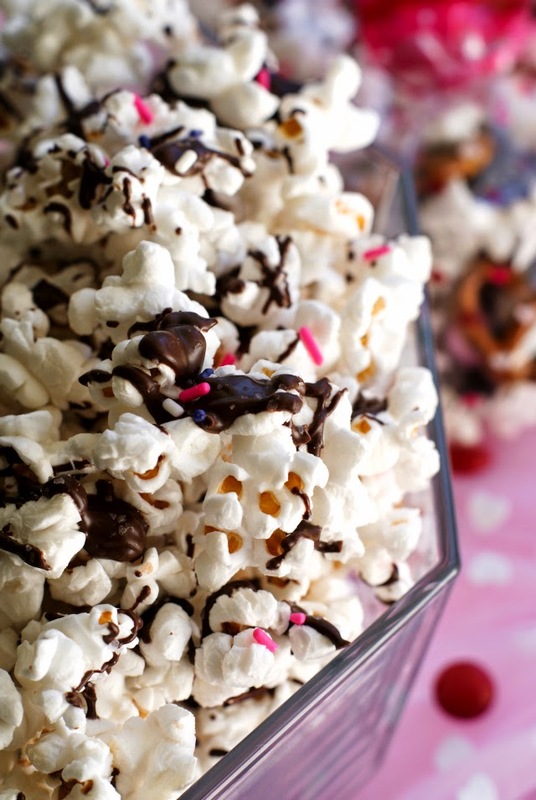 Salted Dark Chocolate Popcorn! I just love sweet and salty together. Yum and yum. 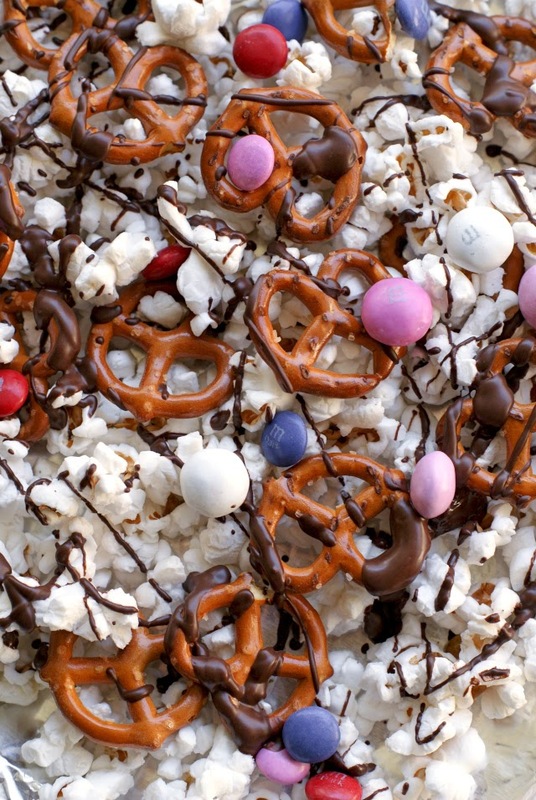 You can incorporate some pretzels or colorful candies and sprinkles to make the chocolate drizzled popcorn festive for the holidays. I added some pretzels, colorful candies, and sprinkles to half of my batch to make them a fun Valentine's Day treat! This Salted Dark Chocolate Popcorn the best! Easy to make, budget-friendly, and deliciously sweet and salty. In a 3-quart stock pot, heat the oil over medium-high heat. Add the corn kernels to the oil and cover with a lid set slightly askew so that the steam can escape. Alternately, cover the pot with an upside down colander. Perfect for letting the steam out! When the popcorn starts popping, gently shake the pot back and forth over the heat to keep the kernels moving. Continue to gently shake the pot until the popping seems to be stopping. Dump the popcorn out onto two foil-lined baking sheets. If including optional add-ins, add them to the popcorn. Melt the chocolate in a microwave or over a double boiler. 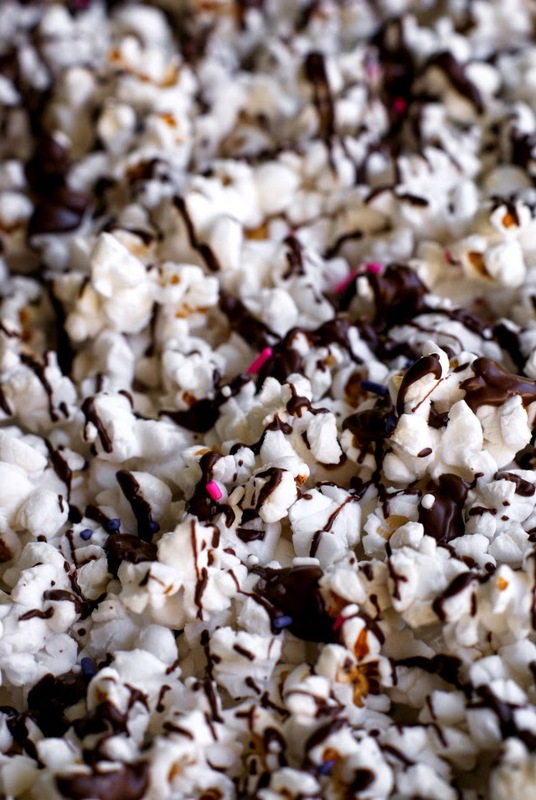 Using a fork, drizzle the chocolate over the popcorn. Immediately sprinkle with coarse salt, to taste. Leave the popcorn on the baking sheets for at least one hour or until the chocolate has set. Make this healthy treat festive for any holiday! Sprinkle with green jimmies for St. Patrick's Day, red and green for Christmas, yellow and purple for Easter...the possibilities are endless! For more information about corn oil and for more recipe ideas, be sure to visit. Mazola.com. This is a sponsored conversation written by me on behalf of Mazola. As always, all thoughts and opinions are 100% my own.